Capped Bust Dimes (Beaded Border) were produced at the US Mint from 1828 to 1837. These coins were designed by William Kneass and are a reduced size version of the wide border variety. The Mint Act of 1792 stated that all coins were to maintain the same standards as the thinner and larger coins previously struck. 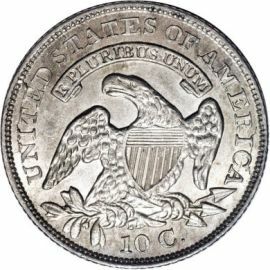 Therefore, the diameters of the half dime, dime and quarter dollar, as well as those of the quarter eagle and half eagle were all reduced and made thicker. previous issue is that these silver dimes have small radial beads inside a raised border. The older coins have flat, widely spaced denticles surrounding the border. 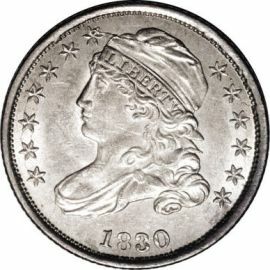 The obverse of this coin features a left facing bust of Liberty wearing a cap with the inscription "LIBERTY". Thirteen stars surround all sides of the bust, with the date below. seated below the entire design.